Holger Schmidt, the Kapany Professor of Optoelectronics at UC Santa Cruz, has been named a Fellow of the Institute of Electrical and Electronics Engineers (IEEE). Elevation to the grade of fellow is a prestigious honor conferred by the IEEE Board of Directors on members with an outstanding record of accomplishments. The total number selected in any one year cannot exceed one-tenth of one percent of the total voting membership. Schmidt, who directs the W. M. Keck Center for Nanoscale Optofluidics at UC Santa Cruz, was honored "for contributions to optofluidics and integrated photonics." He has authored or coauthored over 380 publications and several book chapters in various fields of optics, and he is coeditor of the Handbook of Optofluidics (CRC Press). 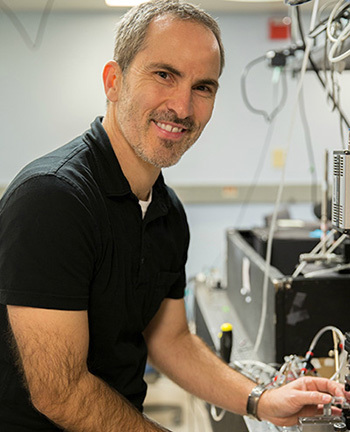 Schmidt and his collaborators have developed technologies for optical analysis of samples on integrated chip-based platforms, with applications in areas such as biological sensors, virus detection, and chemical analysis. Diagnostic instruments based on these "optofluidic chips" could provide a rapid, low-cost, and portable option for identifying specific disease-related molecules or viruses. Schmidt joins ten other UCSC engineering faculty who are IEEE Fellows. He earned his M.S. in physics from the University of Stuttgart, Germany, and M.S. and Ph.D. degrees in electrical and computer engineering at UC Santa Barbara. He joined the faculty of the Baskin School of Engineering at UC Santa Cruz in 2001. The IEEE is the world's leading professional association dedicated to the advancement of technology. The IEEE publishes 30 percent of the world's literature in the electrical and electronics engineering and computer science fields, and has developed more than 1300 active industry standards.